Best Toronto Music School – Baby Music Classes and Toddler Music Programs – 20 Locations! Did you know that Rainbow Songs is Toronto’s beloved and biggest music school for preschoolers? With 20 locations we are sure to have a music class near your neighbourhood. From Kingsway in Etobicoke to The Beaches in the east end of the city and from North of Eglinton in midtown to Trinity Bellwoods in the south, we have classes running from Monday to Saturday all over the GTA. New to Rainbow Songs? Did you know that you can come try our classes for free? Come sing with us in a baby music class or toddler music program today! Call 416 535 5247 or email info@rainbowsongs.com for a FREE TRIAL CLASS! Have fun singing songs with your baby! Rainbow Songs music classes are fun, inclusive, and encourage the joyful participation of children and adults alike. Register today! Join the jam and nurture your child’s musical potential. Read more about our fun family music classes here. Our classes are musical, engaging and interactive! Each lesson includes fun music and movement activities for you and your child. One of the things that sets us apart is that we cater to your child’s specific developmental stages of life. 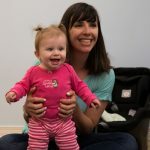 Check out our baby music classes for 0 – 1 year olds, music program for toddlers who are 1- 2 year olds and preschool aged classes for 2-4 year olds. We also have mixed age classes where families can make music together! We encourage families singing together, so please call us if you’d like to have a sibling in one of our specific age classes too. Rainbow Songs baby and toddler music programmes feature familiar songs as well as fantastic Rainbow Songs originals that will have you and your child singing, dancing and bonding together. Looking to join a baby or toddler music program close to home? Check out our 20 locations throughout the city of Toronto. Our music classes for children can be found in these Toronto neighbourhoods. We can’t wait to sing with you! Come see why more than 30,000 families have loved to sing with Rainbow Songs. Enroll today!